It is amazing what history does to surnames, and this is a good example. The name does seem to be locational (the old ridge), but surprisingly this is almost certainly not the origin. In fact it derives from an Olde English personal compound Aedelric (ruler) of the pre 7th Century. The spelling being changed by dialectual pronunciation in the Middle Ages to 'Eldrigge' (1277, Berkshire), whilst in the Middle English period (1500 - 1750) the suffix 'h' has been added to further move the spelling away from its ancestry. 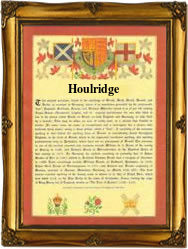 Examples of the modern spelling include Samuel Houlridge who was christened on June 8th 1729. He is particularly interesting as he is the son of the first name holder despite the changed spelling! The first recorded spelling of the family name is shown to be that of George Holdridge, which was dated 1724, a witness at St. Dunstans Church, Stepney, during the reign of King George 1, known as 'Hanover George', 1715 - 1727. Surnames became necessary when governments introduced personal taxation. In England this was known as Poll Tax. Throughout the centuries, surnames in every country have continued to "develop" often leading to astonishing variants of the original spelling.